Ayopa Games has quickly become one of our favorite publishers here at The App Shack. Their first release, W.E.L.D.E.R. was a huge hit, getting named Apple’s Game Of The Week, along with loads of attention from iOS sites and gamers all over the world. Though this first release isn’t really what got our attention. Also released the same day as W.E.L.D.E.R. was Chicken Rescue, a game more directed at kids, but having quite a bit of issues relating to the controls, framerate, and some various other gameplay issues. Chicken Rescue quickly received multiple updates based on user feedback, becoming a very polished and entertaining title. After that, Big Bot Smash was released, and it also had it’s share of issues, which again, were fixed very quickly based on user feedback. M.U.S.E., Mailmen, and Dungeon Crawlers pretty much all went through the same thing. Problems with controls, followed by quick updates after the developers of those titles got active within the gaming community, and listened to player feedback. This is why Ayopa has become one of our favorite publishers. Every single one of the games that they’ve published has had developers that have gotten their hands dirty, been able to admit that their game’s first version wasn’t perfect, listened to player feedback, and quickly fixed whatever issues were brought up. Ayopa also being very responsive in passing on user feedback to the developers also helps quite a bit. They’re a publishing company who’s very interested in user feedback, and also releases games from developers who feel the same. 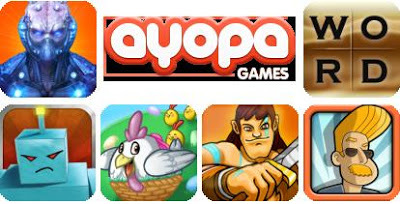 Not to mention, every single one of the releases that has gone through Ayopa has wound up being a top notch, highly entertaining gaming experience. So when we got e-mails saying that their next title, MacGuffin’s Curse, was coming to the AppStore this Aril 19th, we got very excited. 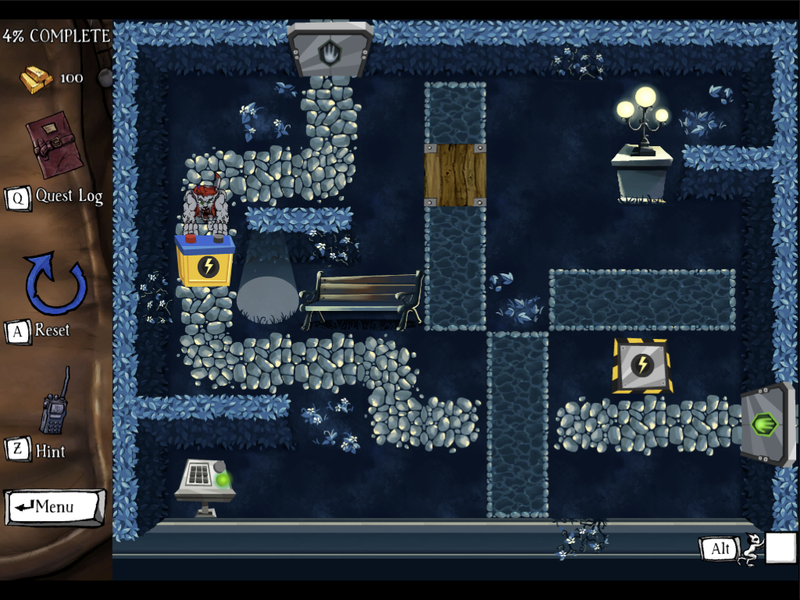 This time around, Australian developer Andrew Goulding’s company, Brawsome (who in 2010 won Freeplay’s “Best Australian Game” for the PC/Mac title Jolly Rover) is bringing unique puzzler, MacGuffin’s Curse to the iDevice, as well as Steam and the Mac Store. MacGuffin’s Curse has you playing as a magician turned thief, MacGuffin, who winds up needing to steal a diamond to pay the rent. Things don’t go as planned, and MacGuffin winds up being forced to steal the diamond for an ex-detective. Putting the diamond around his neck, MacGuffin turns into a werewolf, capable of moving large objects, and smashing blockades along the citywide security system. 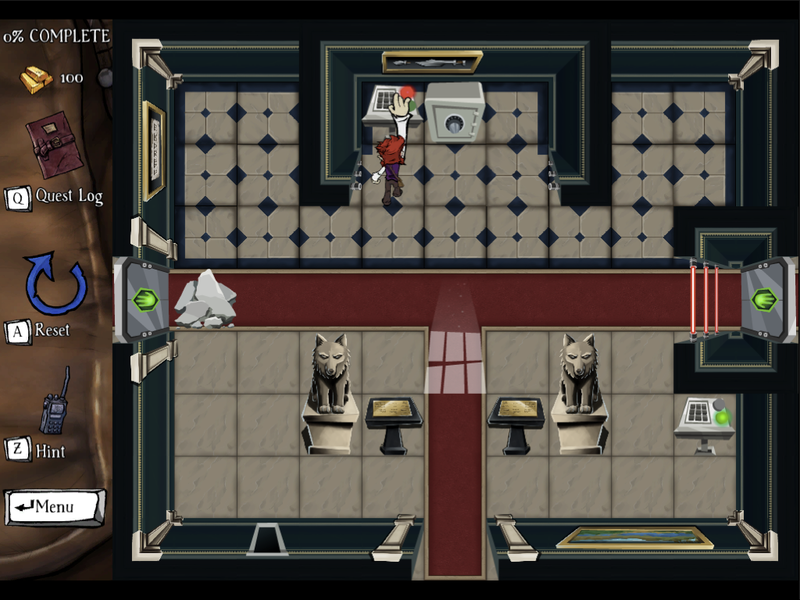 You’re able to change between human and wolf forms whenever touching the moonlight, and will need to constantly switch between the two to make it through each of the puzzles, unravelling a witty and humorous plot. 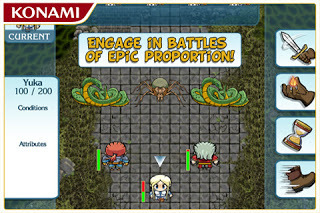 This top-down adventure is full of fantastically hand-drawn art set up as a comic that you’ll be able to explore and find pieces of throughout the game, has simple swipe-drag-tap controls, hundreds of puzzles increasing in difficulty as you progress throughout the game, catchy music, a great cast of characters, and smooth, entertaining gameplay. 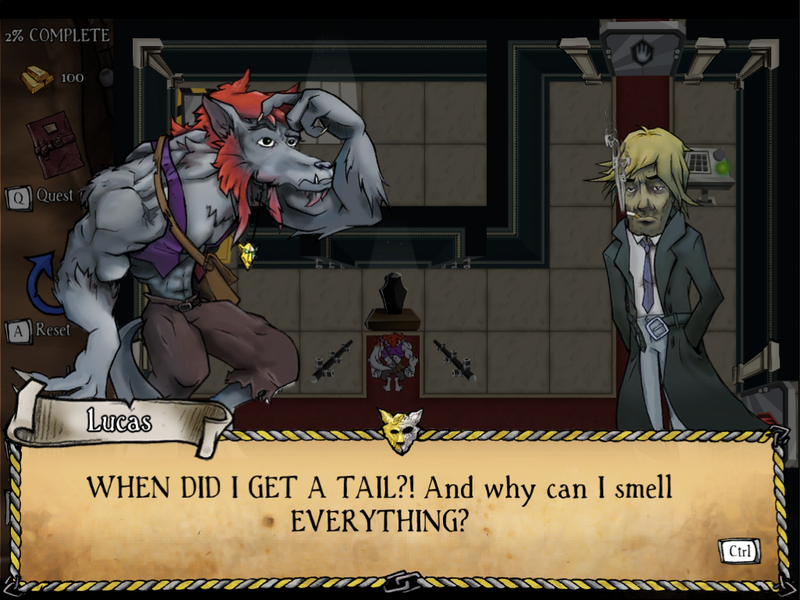 Published by Ayopa, MacGuffin’s Curse will be available for purchase in the AppStore (for iPhone, iPod, and iPad), Mac Store, and Steam on Thursday, April 19th. Make sure to keep an eye open for it, and also check out some extra information, screens, and videos on both the Ayopa and Brawsome Websites. Wednesday Night Releases – Chaos Rings II, MotoHeroz and more! There’s a great variety of games coming out tonight including some from prized developers Square Enix and Ubisoft. As you probably know all of these games will be coming out around 11:00 p.m. Eastern Standard Time in the U.S. or much earlier depending on if you live in the eastern hemisphere such as New Zealand where the games are first available. Links included in the article lead to the app in the NZ market not the U.S. one. Pretty decent roundup tonight eh? Leave a comment down below on which ones you would like to see us review for you. Happy Pi Day! Coming Tonight – Soul Calibur, JAZZ, Ash II: Shadows and tons more! The App Store is finally starting to pick up speed and tonight the flood gates are opening as tons of quality titles are launching simultaneously. Check out the fine selection below. Soul Calibur is the port of the 1999 Dreamcast version of the game and is debuting to the tune of thirteen dollars. Though the typical Apple gamer may balk at the price tag, fans of the fighting series are probably mashing the buy button as it releases around the world. The popular JRPG Ash, now has a sequel which is surprisingly published by Konami. There are two versions called Silver and Gold. Apparently Silver gets you half off all future content updates presumably available by iAP. Gold, while being a bit more expensive, promises free content updates forever. Looks like an interesting turn-based combat game with an interesting story. Coming from Smuttlewerk studios, we are sure this is a top of the line game. Free to try platformer with full game unlock for $1.99. Looks like it differentiates itslef from the other platformers with an unique control system. Another of the many word game that have been taking the Appstore by storm over the past few weeks. From the description it seems like a combination of Bejewled, Tetris, and Spell Tower. Certainly looking forward to this one. Coming from the master of retro games, Llamasoft, this will tide you over till the rest of the releases come out and probably for the rest of your weekend! Just got it and am really loving it so far. Adapted from the Wii to the touchscreen interface, Overturn certainly looks like an interesting game. My only worry is that the controls may not be the best. Other than that looks great! Now it’s your turn to have your voice heard! Let us know in the comments which of these games you would like to win and we will try to secure a code for you. First person to ask for a specific game gets it IF we receive the code. You are more likely to win if the game is not as well known or from indie developers. One entry per person. Plethora of New Releases out tonight! Because of the Appstore freeze that is occurring on the 22nd through the 29th a lot of new releases are being unleashed today rather than the typical Wednesday night releases. The typical time zone rules do apply though as the U.S. will receive these games at 11:00 at night. Note: Links will not lead to the U.S stores as it is not available there. These links lead to the NZ Appstore. Post will be updated with the U.S. links once they are out.